I don’t believe in judging a book solely on its cover, but I do believe that covers are important, since they are the hook by which the author catches the reader’s attention. I used to work in magazine publishing and we always worked to a two-second rule, meaning that a front cover has to grab your attention within the first two seconds, because this is as much time as a typical newsstand customer will spend scanning the covers on each shelf. If you haven’t hooked them in those two seconds then the chances are they won’t pick up your magazine and investigate further. Although I think people spend more time perusing books on a store shelf (virtual or physical) the principle is the same. I’m not sure if this is the case for all authors, but I knew very clearly what I wanted the cover for The Planetsider to look like from quite an early stage, even before the first draft was finished. The cover is based on a scene in chapter two, where Ethan is sitting under his favourite tree on a mound outside the settlement walls with the ruin of a once-great city in the far distance, staring up at the mysterious lights in the night sky and pondering their meaning. It’s an important scene as it provides essential background information on Ethan’s character and what motivates his actions throughout the story, for better or worse. I could see this scene very clearly in my head and I think the cover designer did a great job interpreting my mental image and forming it into a real one. Interestingly, it was while I was looking through my past reading list to pick my top five covers for this guest blog that I was reminded of how one cover in particular had influenced my own. 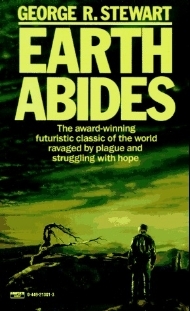 The book is Earth Abides, by George R. Stewart, which is one of my favourites and undoubtedly an influence for more than just the cover. In the 1981 cover a man stands looking out over desolate landscape. It’s a simple cover, using only black and yellowy-green colours and an almost crude, hand-painted style, but I love it, and wanted to evoke a similar feeling for the cover of The Planetsider, which has some similar themes, but give it a more modern look. I’m really happy with the finished cover, and hopefully fans of the genre will be too. So with covers in mind, here is a list of five of my favourite book covers, Earth Abides included, and why I like them. I’d be interested to hear what your favourite covers are, so perhaps leave a comment and let me know. I love the simple, hand-painted style and limited colour palette on this cover. What is the man in the image looking at and what is he thinking? I also love the old tree and how it seems to be pointing towards something on the horizon. If anything, I think the massive wall of text takes away from the impact of this cover, and it’s the only part about it that I don’t like. The Stars My Destination is one of my all-time favourite Sci-Fi books. I found it for the first time via the SF Masterworks series, and it’s this cover that I’ve picked, because it’s the one I personally associate with the book. It’s the face of Gully Foyle that made me pick it up in the bookstore, and in particular the tiger-like tattoos on his face, which intrigued me. The tattoos, which Foyle has removed later in the book, but which still show when he becomes emotional, are important to his character. I also like how it pays homage to early editions of the book when it was called Tiger! Tiger! and not The Stars My Destination. I’m not sure that I would describe the 1999 SF Masterworks cover as attractive, because in all honestly it’s pretty terrifying, but it certainly did the job of hooking my interest, which is the point of a cover, after all. It’s the yellow-haired figure (a woman?) just behind the hellish, vampiric face in the foreground that captures my focus. It’s all very unsettling, but weirdly, I still really like it! I discovered this book long before the Will Smith movie, and I’m glad of it, as the Hollywood take on this story is very far from the novel. I’m generally very accepting of movie adaptations changing things up to make the story work well on the silver screen, but I think this adaptation was so unlike the book that it shouldn’t have even had the same title. Okay, so this one is a curve-ball since it’s clearly not a Sci-Fi novel, but it’s one of my favourite stories, in book and movie formats. I love this cover from the 30th anniversary edition, because the depictions of Wesley and Buttercup have clearly been based on the actors who played them in the 1987 movie, namely Cary Elwes and Robin Wright. It looks like the scene where they emerge from the Fire Swamp, buoyed by having survived its terrors, only to be confronted by ‘The Six Fingered Man’, Count Rugen. I think it’s a beautiful cover and a timeless story of True Love and High Adventure! I think I found this one in a charity shop or perhaps a National Trust bookstore, and other than being naturally attracted to the rather illustrious author’s name in black letters across the top of the book, I was intrigued by the futuristic-looking policeman on the cover. He has obviously discharged his weapon, and the wispy nature of the smoke trail suggests he held this pose for some moments after firing. Who has he shot and why does he look so melancholic? It certainly got my attention, and although as a cover I’m not sure it accurately reflects the contents, I still really love it.